As Stryper prepares to head out on tour in support of their latest album, “Fallen,” a social media post suggesting that frontman Michael Sweet and presidential candidate Ted Cruz might be the same person has gone viral, becoming a top trending topic on Facebook for over three days. It is so mind boggling at times what goes viral. The band will tour this spring in support of their new album, “FALLEN” (Frontiers Music SRL) before launching a world tour this fall marking the 30th anniversary of the band’s historic album release, “To Hell with the Devil.” Dates for this fall’s To Hell with the Devil Tour, which will be booked by William Morris Endeavor (WME), will be announced at a later date. 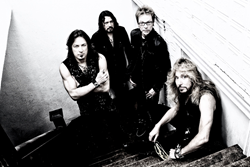 For spring tour dates and exclusive VIP Meet & Greet packages, visit Stryper.com. Rocking since 1984, Stryper is responsible for such classic '80s metal albums as “Soldiers Under Command,” “To Hell with the Devil” and “In God We Trust.” In fact, Stryper is the first band to ever have two songs in MTV’s Top 10 simultaneously with their hits “Free” and “Honestly.” After a sabbatical for much of the 1990's, Stryper returned strong in the early 21st century. To date, the Dove Award-winning and GRAMMY-nominated band has sold over 10 million records worldwide.